Hubbardston’s Nonesuch originated in Hubbardston, Massachusetts in the early 1800’s. 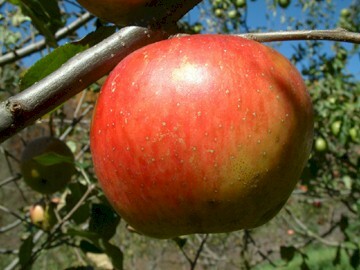 Although it is considered to be a fine flavored apple, it never achieved much recognition in the South. Beach describes the apple as “excellent for dessert but less satisfactory for culinary use.” Fruit is medium to large in size with smooth yellow skin blushed with reddish-brown and overlaid with dark red striping. The aromatic yellow flesh is tender, juicy, and sweet. Ripens October to November.